The 2018 Winter Olympics are almost here! And, of course, everyone is already talking about the events that have me as mesmerized as the gymnasts in the Summer Olympics - figure skating. In fact, it seems everyone loves figure skating, so much that the sport is full of drama and scandals. And with the Winter Olympics almost here, people are already talking about the potential for biased judges. We've long known that ratings from people are prone to biases. Some people are more lenient while others are more strict. We recognize that even with clear instructions on ratings, there is going to be bias. This is why in research we measure things like interrater reliability, and work to improve it when there are discrepancies between raters. Now, bias in terms of leniency and severity is not the real issue, though. If one judge tends to be more harsh and another tends to be more lenient, those tendencies should wash out thanks to averages. (In fact, total score is a trimmed mean, meaning they throw out the highest and lowest scores. A single very lenient judge and a single very harsh judge will then have no impact on a person's score.) The problem is when the bias emerges with certain people versus others. As a psychometrician, judge ratings are a type of measurement, and I personally would approach this issue as a measurement problem. 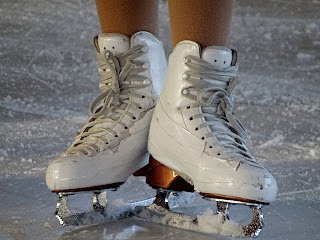 Rasch, the measurement model I use most regularly these days, posits that an individual's response to an item (or, in the figure skating world, a part of a routine) is a product of the difficulty of the item and the ability of the individual. If you read up on the ISU judging system (and I'll be honest - I don't completely understand it but I'm working on: perhaps for a Statistics Sunday post! ), they do address this issue of difficulty in terms of the elements of the program: the jumps, spins, steps, and sequences skaters execute in their routine. There are guidelines as to which/how many of the elements must be present in the routine and they are ranked in terms of difficulty, meaning that successfully executing a difficult element results in more points awarded than successfully executing an easy element (and failing to execute an easy element results in more points deducted than failing to execute a difficult element). But a particular approach to Rasch allows the inclusion of other factors that might influence scores, such as judge. This model, which considers judge to be a "facet," can model judge bias, and thus allow it to be corrected when computing an individual's ability level. The bias at issue here is not just overall; it's related to the concordance between judge home country and skater home country. This effect can be easily modeled with a Rasch Facets model. But the video does not show the easier element, a triple Lutz, that Kim didn't perfectly execute. (Once again, she landed it.) Admittedly, I only watched the medal-winning performances, and didn't see any of the earlier performances that might have shown Kim's superior skill and/or Sotnikova's supposed immaturity, but I could see, based on the concept of element difficulty, why one might have awarded Sotnikova more points than Kim, or at least, have deducted fewer points for Sotnikova's mistake than Kim's mistake. In a future post, I plan to demonstrate how to conduct a Rasch model, and hopefully at some point a Facets model, maybe even using some figure skating judging data. The holdup is that I'd like to demonstrate it using R, since R is open source and accessible by any of my readers, as opposed to the proprietary software I use at my job (Winsteps for Rasch and Facets for Rasch Facets). I'd also like to do some QC between Winsteps/Facets and R packages, to check for potential inaccuracies in computing results, so that the package(s) I present have been validated first.